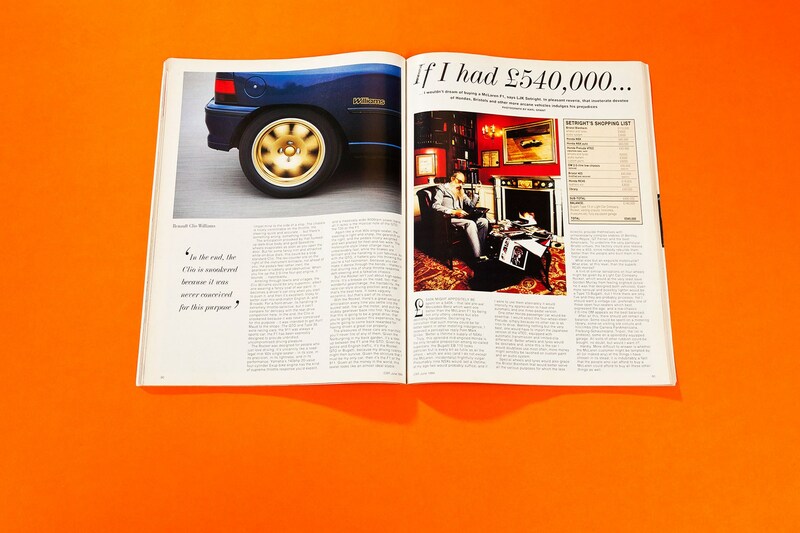 ► How would he spend £540k on cars? Truly, this splendid mid-engined Honda is the only tenable position among the so-called supercars: the Bugatti EB 110 looks patrician but is every bit as futile as all the others – which are also (and I do not except the McLaren, incidentally) frightfully vulgar. Presumably nine NSXs would last a lifetime: at my age two would probably suffice; and if I were to use them alternately it would intensify my appreciation to have one automatic and one three-pedal version. One other Honda passenger car would be essential. I would select the four-wheel steer Prelude (below), simply because no other car is as nice to drive. Wanting nothing but the very best, one would have to import the Japanese version of the VTEC, equipped with automatic transmission and limited-slip differential. Better wheels and tyres would be desirable and, since this is the car I would use most often, more money might sensibly be lavished on custom paint and an audio system. Special wheels and tyres would also grace the Bristol Blenheim that would better serve all the various purposes for which the less eclectic provide themselves with unnecessarily complex stables of Bentley, Rolls-Royce, GT Ferrari and the best Americans. To underline the very particular Bristol virtues, the factory could also restore for me a 403, since nobody rebuilds them better than the people who built them in the first place. What else buy an exquisite motorcycle? What else, at this level, than the superb RC45 Honda? A hint of similar sensations on four wheels might be given by a Light Car Company Rocket, which would at the very least save Gordon Murray from feeling slighted (since he it was that designed both vehicles). Even more sensual and possibly lighter would be a Type 13 Bugatti, but I I think there are only five and they are probably priceless. Yet I should want a vintage car, preferably one of those open four-seaters which best expressed the age, and a low-chassis 2.0-litre OM appeals as the best balanced. After all this, there should yet remain a balance. Some could be spent on a motoring library, some visiting old circuits and hillclimbs (the Carrera Panamericana, Freiburg-Schuainsland, Tripoli, the list is endless), some on a splendidly-equipped garage. All sorts of other rubbish could be bought, no doubt, but who would want it? Hardly. More difficult to answer is whether the McLaren customers might be tempted by all (or indeed any) of the things I have chosen in its stead; it is indubitably a fact that the people who can afford buy a McLaren could afford to buy all these other things as well.